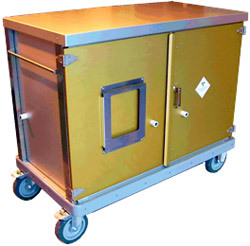 Cabinet trolley specfically designed for transporting medical equipment between decontamination centres and hospitals. The trolley meets the United Nations recommendations for packaging and transport of clinical waste by road - UN3291. Lockable doors seal against durable gasket when closed. Two removable shelves supplied as standard giving three effective load surfaces including floor. Two swivelling castors with brakes, two fixed wheels with non-marking shock absorbing tyres. Push pull handles, A4 document frames inside and out and optional tow bar. 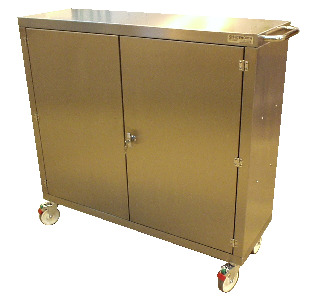 Electric Lift Trolley for use in loading Washer Disinfectors and Autoclaves available in 304 or 316 Stainless Steel. The top of the trolley can be configured to accept any type of loading rails to make them compatible with all washing and sterilizing equipment. 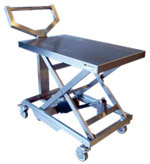 Lightweight and very mobile reducing any manual handling issues, the trolley is ideally suited to sterile and pharmaceutical operations as it does not use hydraulics that may cause unwanted oil leakages. The electric actuator has been tested to EMC standards and the battery pack can be removed and recharged via a wall-mounted charger plugged into a standard mains outlet. Operatives are not required to lean into the bin; Greatly reducing the risk of back injury When loading/unloading the level remains constant irrespective of mass or size of load. With simple adjustment the sensitivity of the shelf can vary from 10Kg to 200Kg or from 100mm to 500mm. Loads can be placed anywhere on the shelf and it will remain level. 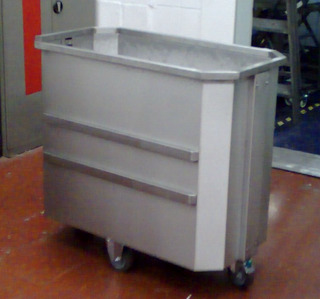 Transfer carts can be made to suit customer requirements and configured to accept a range of goods including; Discard Boxes, sterile and none sterile products, instruments and other medical goods. Transfer Cart can be configured for outdoor use by specifying suitable castors or wheels. Internal shelving options include both solid and welded mesh. Selected use of stainless steel components allows for full cleaning at elevated temperatures. 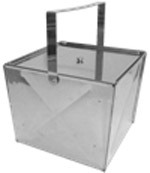 This specially designed box has been developed to provide a safe method of handling and sterilizing laboratory waste. Its unit size, comfortable to manoeuvre even when fully loaded, fully utilises autoclave chamber space and is self-stacking. Manufactured from stainless steel the unique design features a carrying handle, pouring aid and removable trivet and lid. For loads which are prone to stick to the inside walls of the box, the surface can be coated with a P.T.F.E. finish as an optional extra. The efficiency of the system works by directing steam down the corner ports of the box into the void created by the trivet. The steam then penetrates into the discard through perforated holes in the trivet. The void doubles as a reservoir for any liquid which can be emptied without removing the box contents or lid by pouring via the corner ports.